Ever find yourself wondering if Excel could help you answer the question: “What values would I need to get a known result?” The What-if Analysis features, available in Excel 2010 and up, give you the tools to do just that. Unlike functions and formulas that take given values and return a result, what-if scenarios allow you to explore the results of multiple variables and Goal Seek lets you specify the result and then determines the values needed to generate it. You can learn about What-if Scenarios here. 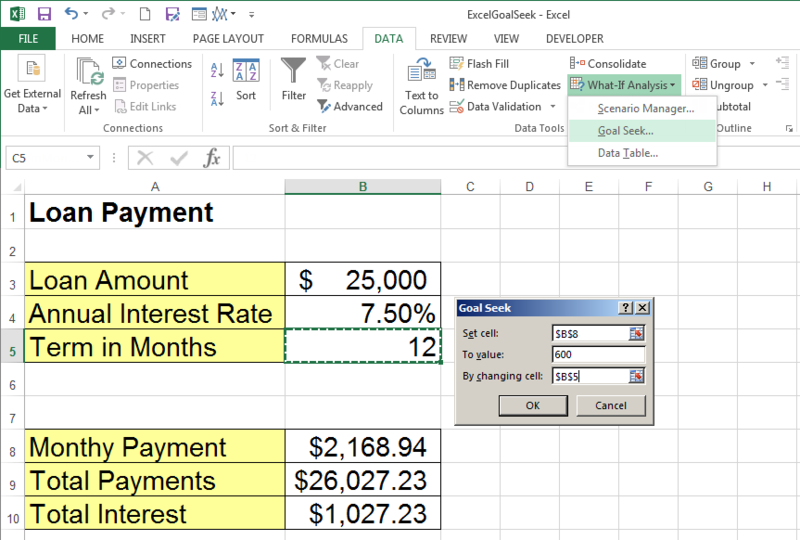 In this article, we’ll look at Excel’s Goal Seek feature. 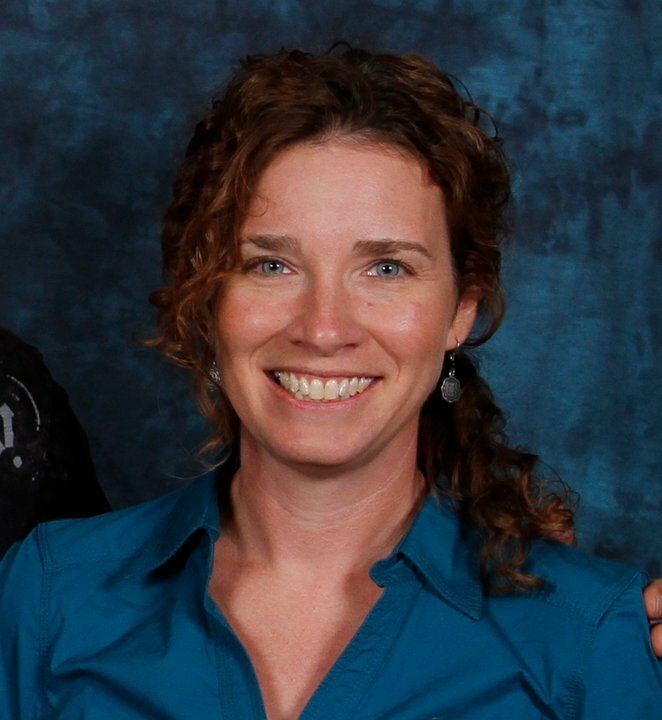 Set up your table to include all known data and the formulas needed to calculate the results. 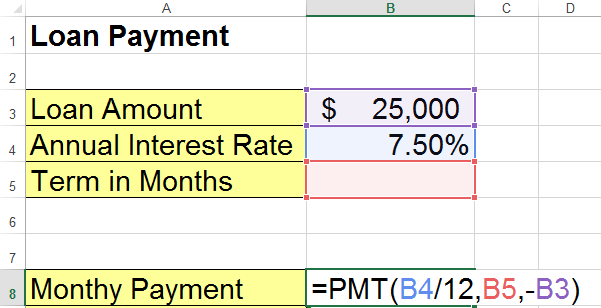 In our example, we use the PMT function in B8 to calculate the monthly payments based on our other known factors (Interest Rate and Loan Amount) and our unknown value (Term in Months).Put any value in the unknown cell to test your formulas. On the Data tab, select Goal Seek from the What-if Analysis dropdown menu. To value: Type the amount you want the formula to return. In this case, we would like a monthly payment of $600. Click The dialog box will indicate that it is searching for a solution that meets your criteria. If it does, you will see the Goal Seek Status dialog box, and your table will be updated to show the solution. Notice that the result may not be an even number like you might want in this case. It is also possible that Excel is unable to find a result if the criteria is not solvable. Even so, Goal Seek is a useful tool for “working backwards” to figure out values in a complicated equation without having to “guess and try again”. Goal Seek will only work with one result and one variable. If you wish to find a specific answer with multiple variables and constraints, you will have to use the Solver add-in. To access Solver, go to the Options window from the File tab. Click Add-Ins. 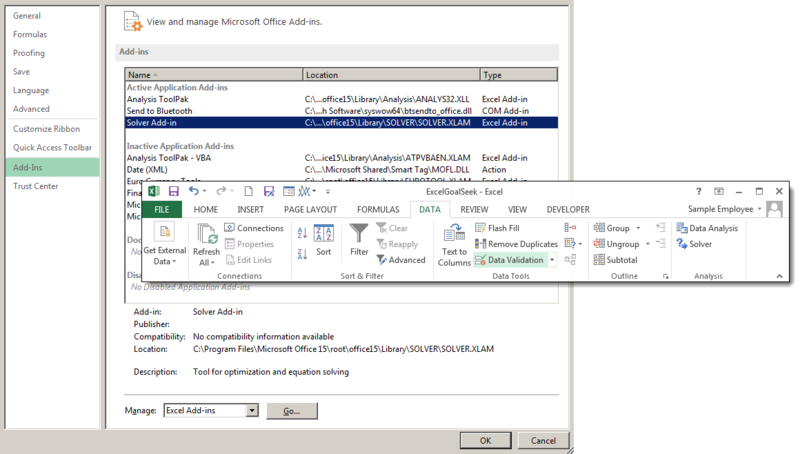 Select Solver Add-in in the Add-ins pane, then click OK. The solver feature will now appear in the Data tab.